Want to know more about the CPK Blood Test? Then you have come to the right place. The abbreviation stands for a chemical called creatine phosphokinase that gets released from your muscle cells anytime those muscle cells die. Now, don’t let this alarm you, all of us have a number of muscle cells dying throughout our body on a constant basis. So, therefore there is no such thing as a CPK of zero, it will always be ‘something’, and since this is a marker of muscle cell death and damage, a low CPK is really meaningless, and a normal CPK blood test is- well normal. It’s only an elevated CPK that has any meaning at all, and that’s what we’ll discuss on most of this page. Now, one of the downsides of the CPK Blood Test is that it’s ‘non-specific’ for muscle death. This means that a high CPK does not tell you WHERE that muscle death is coming from or whether it might be normal or abnormal. Muscle is muscle and every muscle in the body, from your leg muscles to your heart muscle cells will release CPK when they die. Therefore having a heart attack or running a marathon could both generate elevated CPK levels. However, now there is a more specific test that they use in the hospital called CPK-MB, which IS specific to damage to the heart and is one tool that doctors use to determine whether someone is having a heart attack or not. I already mentioned that a heart attack may be one reason why the CPK blood test are elevated. But if you have elevated CPK levels and your doctor sent you home or took them on an outpatient basis and you haven’t been able to talk to him yet, please don’t panic. It’s incredibly unlikely that you are walking around with high CPK levels due to a heart attack if you are not so severely ill that you are in the hospital. These high CPK levels from a heart attack generally occur from ACUTE heart problems- meaning that you are having a heart attack NOW. High levels due to a heart attack decrease back to normal within a day of a heart attack being stopped. If you are sitting at home reading this while reviewing your blood test results, then that is almost certainly not the reason for your elevated CPK Blood Test. Another reason that you might have elevated levels is due to accident or injury. 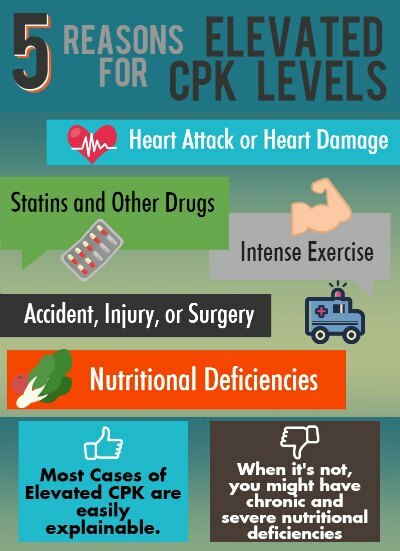 If you have just been in a car accident, had a bad fall, recent surgery or had some other injury that you are recovering from, a high CPK level might be normal for a while. These levels should gradually decrease over a period of days to weeks and would be a completely normal part of the healing process. The use of Statin Medications, also known as cholesterol lowering drugs, is an extremely common reason for elevated levels. And with millions of Americans taking these drugs, any elevation in the CPK test should be a cause for concern and be taken seriously by your doctor. If you have high CPK levels and are on Statin drugs, please see my page on Statin Side Effects to learn more about why the muscle damage from these drugs is so serious that it can and has led to Statin Muscle Weakness and even a deadly condition known as Rhabdomyolosis. Unfortunately, few doctors take this as seriously as they should, leaving previously healthy people with muscle pain and decreased ability to function when it could have easily been avoided had they simply known about the need for a few key nutrients that could reverse this muscle pain and damage, or even completely prevent the need for Statin Drugs in the first place! So, while there are explainable and medically treatable causes of an Elevated CPK Blood Test, if there is no explainable reason and your levels have been significantly elevated for 2 or more times, then the best course of action would be to consider that you might have one or more significant nutrient deficiencies that can be easily treated. 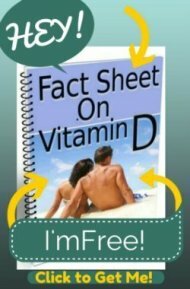 Unfortunately, it’s unlikely that your doctor will look for any of these deficiencies, and unless you look into this type of information yourself using this site to help guide you, you may suffer for years without discovering that you had a problem that was simple and cheap to solve on your own. 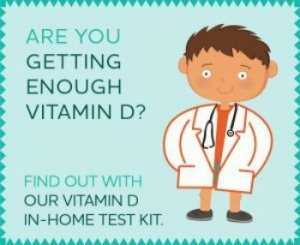 Keep reading to read about one of the more likely nutritional deficiencies that might be causing high CPK Levels, Vitamin D Deficiency, and how you probably have it. This section is for the rest of you who don’t fall into any of the categories above and you have no explainable medical reason for a CPK that has remained elevated for a couple of blood tests. While not very well known to the western medical community, if you have a chronically elevated CPK and no one can find a medical reason for it, then it’s time to consider Nutritional deficiencies before looking at other more serious problems such as fibromyalgia if you have widespread pain, or muscular dystrophy if you have weakness or neurologic problems such as difficulty walking. Any of these could be causing these chronically high levels, especially if you have other symptoms as well. Vitamin D is an essential component to build muscle, and muscle wasting as indicated by your high CPK levels would be the first thing that I would suspect since up to 85% of the population is deficient. Magnesium deficiency often coexists when there is vitamin d deficiency- EVEN IF your Magnesium Levels are normal. Vitamin B12 deficiency is most often implicated when there are neurologic problems, while low levels of Coenzyme Q10 and Carnitine are often due to problems in the energy production engines of the cells called the Mitochondria.